Our family hotel is a classic type two-star hotel located in Skaleta in Municipality of Rethimno and it is 11 km east of the town of Rethimno on the northern coast of Crete. It is in the middle of Crete, 1 hour away from the airports of Heraklio or Chania. The beach is so near that guests can walk there in two minutes. 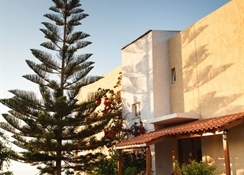 Our hotel consists of a main building with 17 guestrooms. In our hotel there is a spacious veranda with garden view where our guests can have Continental breakfast in the morning or have a drink in the afternoon and in the evening.There is a café-bar open from early in the morning until late at night. Also, parking space is available to all our guests for free. We offer free WiFi Internet in all the rooms and at the lounge, at the lobby and at the veranda. At the reception you can find travel information, bicycles, sunbeds, a collection of music CDs and DVDs to watch. We are happy to help you with everything you need. Skaleta is a quiet seaside place 11 kilometres east of Rethimno. In Skaleta you can find anything you wish. There are taverns, a pub and other shops like a jewellery shop along the beach near the hotel. On the east end of the beach there is the picturesque church of Saint Nicolas. It is about 500 metres from the hotel. Another advantage of Skaleta is that there is regular bus service to Rethimno every 20 minutes. The bus stop is 100 metres from the hotel. You can also take the bus to visit nearby beaches like Panormo and Bali, or even go to Heraklio and Chania. HOTEL “BABIS” consists of 17 en-suite rooms (double and single). 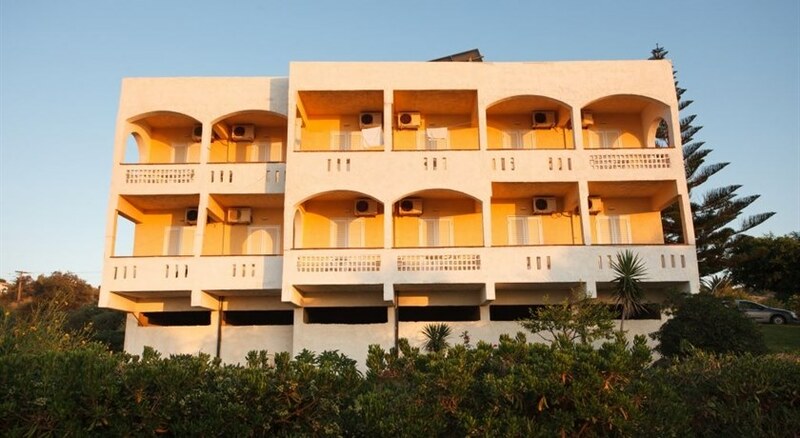 All rooms have got a spacious balcony, a TV, a fridge, air conditioning, a safe and Wireless internet. There is a bathroom with a shower in every room. Most of the rooms overlook the sea and some of them have garden view. The view of the sunset from the balconies is breathtaking. On a clear day you can see as far as Akrotiri in Chania. There is free cleaning service every day except Sundays. "If you choose to stay in Skaleta, you will have a wide variety of nearby places to visit. One option is the famous Arkadi Monastery, which is 12 km from Skaleta. Another place to visit is Maroulas village where you can see an old tower and an old fashioned oil press. You shouldn’t miss visiting Margarites, a village with the most pottery workshops in Rethimno, or Eleftherna, one of the most important archaeological sites dating back to 3000BC. What is more, you could visit Melidoni Cave, a legendary underground cave. Hromonastiri is also a very clean and beautiful village with a Venetian touch next to Mili Gorge which name comes from the water mills whos ruins still stand along the river. Last but not least, the old town of Rethimno is a must for everyone. The Fortezza Fortress, the Venetian Harbour, the Archaeological Museum, the Modern Art Museum, Paleontological Museum, Rimonti Fountain, Neratzes Minaret, Porta Guora are only a few of the most interesting sights in Rethimno. You can reach all of the above places in less than 30 minutes. To sum up, if your idea of an ideal holiday is to have a good night’s sleep, have a rich breakfast in the morning and then set off to explore the world around you, we recommend that you spend your holiday at HOTEL ‘BABIS’. On the other hand, if all you need is to relax near the sea and take a break from the hectic city life, then HOTEL ‘BABIS” is the right place for your holidays. Our hotel caters for travelers, individuals, couples, or groups.